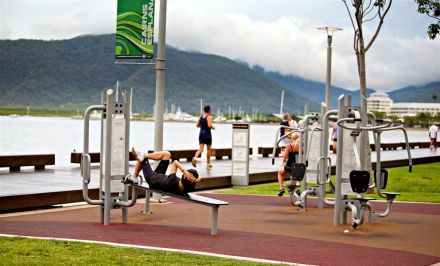 This one hour class utilises the fantastic fitness stations spread out along the Esplanade to provide participants with an 'all over' body workout. The class is suitable for all fitness levels and abilities. The class consists of a series of timed circuits (e.g. 30 seconds on each machine/station) and once a station has been utilised, the group will jog/skip/hop/lunge/squat to the next lot of fitness stations.